ATLANTIC 60′. This kind of reasonable power cat is probably the future of the power boats. 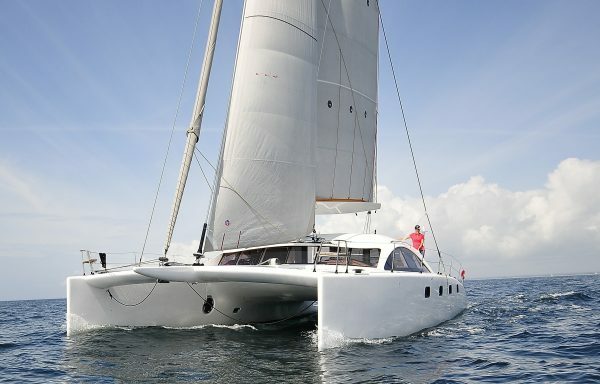 The concept by Marc Lombard (famous french designer of many trimarans ORMA 60′, yachts, inventor of the modern curved daggerboards… and Daniel Curt owner and engineer is visionary and simple. This cat built by famous HERVÉ Yard in La Rochelle in composite wood époxy is a fantastic solution for long and economic range cruising. Modern child of the SANTORINI 65′ (Joubert-Nivelt-Prometa), brother of the ETOILE 65′ (tested in 2014 during 200nm with 50-60kt of wind! ), ATLANTIC is probably one of the best powered Cat existing on the world market. She’s not a yacht but a perfect machine for expedition and blue water voyages.